Frustration crops up throughout nature when conflicting constraints on a physical system compete with one another. The way nature resolves these conflicts often leads to exotic phases of matter that are poorly understood. This week’s issue of Science Magazine features new results from the research group of Christopher Monroe at the JQI, where they explored how to frustrate a quantum magnet comprised of sixteen atomic ions – to date the largest ensemble of qubits to perform a simulation of quantum matter. In this experiment, JQI physicists engineer a quantum magnet using lasers and ion qubits. The ion trap platform has long been a leader in the field of quantum information and is an ideal playground for quantum simulations (see image 1 in gallery of ion trap used here). Ions are charged particles that interact strongly via the Coulomb force, which is an attraction/repulsion that decreases as particles separate. 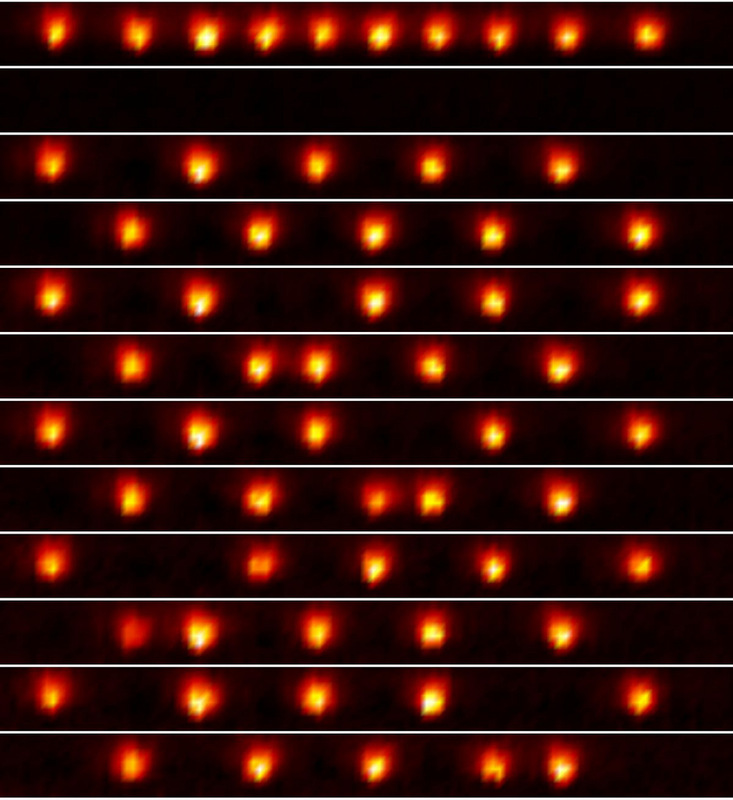 When a handful of positively charged ytterbium ions are thrown together, they repel each other, and, for this oblong ion trap, form a linear crystal (see gallery image 2 of real camera images of single ions arranged in a crystal). Each ion has two internal energy states that make up a qubit. Laser beams can manipulate the Coulomb force to create tunable, long range magnetic-like interactions, where each ion qubit represents a tiny magnet*. Imagine that invisible springs connect the ions together. Vibrations occurring on one side of the crystal affect the entire crystal. This is called collective motion and is harnessed to generate a force that depends on how a magnet is oriented (which state the qubit is in). The team can program this state-dependent force by simultaneously applying multiple laser beams, whose colors (frequencies) are specially chosen with respect to the internal vibrations of the ion crystal. The amount of influence each magnet has on the rest of the chain primarily depends on the choice of laser frequencies (See Frequency Sidebar at the bottom of this article for more information). The crystal geometry has little to do with the interactions. In fact, for some laser configurations the ions that are farthest apart in space interact most strongly. Phenomena due to this type of magnet-magnet interaction alone can be explained without quantum physics. 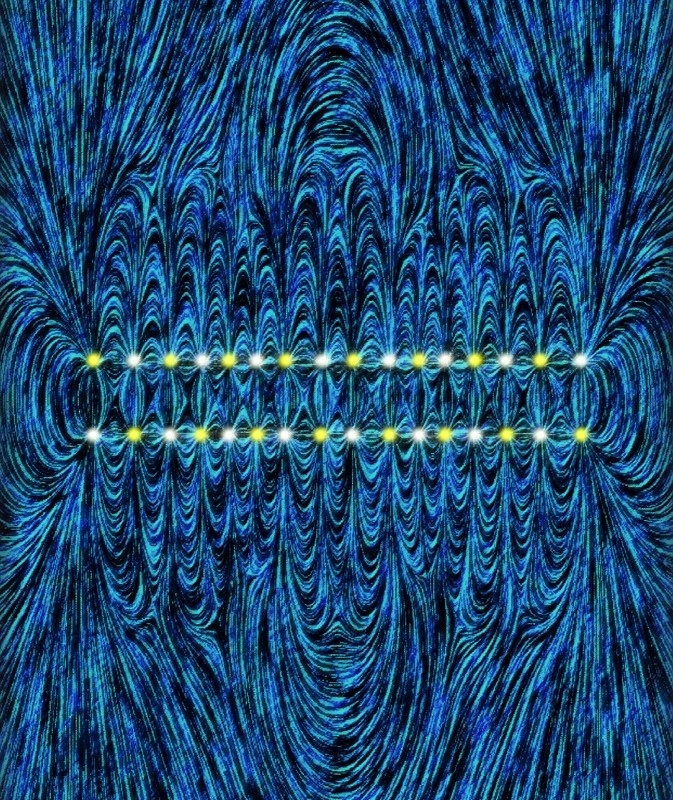 An additional uniform magnetic field, (here created with yet another laser beam), is necessary for introducing quantum phase transitions and entanglement. This added magnetic field (oriented perpendicular to the direction of the interactions) induces quantum fluctuations that can drive the system into different energy levels. In the experiment, the long-range ion-ion interaction and a large effective magnetic field are turned on simultaneously. In the beginning of the simulation the ion magnets are oriented along the direction of the effective magnetic field. In the quantum world, if a magnet is pointing along some direction with certainty, its magnetic state along any perpendicular direction is totally random. Hence the system is in a disordered state along the perpendicular direction of magnetic [spin] interactions. During the quantum simulation the magnetic field is reduced and the ion crystal goes from being in this disordered state, with each ion magnet pointing along a random direction, to being determined by the form of the magnetic interactions. For some cases of antiferromagnetic (AFM) interactions, the spins will end in a simple up-down-up-down-etc. configuration. With the turn of some knobs, the team can cause the AFM interactions to instead frustrate the crystal. For example, nearest neighbor AFM interactions can compete strongly with the next-nearest neighbor interactions and even the next-next-nearest neighbor constraints. The crystal can easily form various antiferromagnetic combinations, instead of the simple nearest neighbor antiferromagnet (up down up down). In fact, with a few technical upgrades, the researchers can potentially engineer situations where the magnets can reside in an exponentially large number of antiferromagnetic states, generating massive quantum entanglement that accompanies this frustration. *Physicists use mathematical spin models, such as the Ising model studied here, to understand quantum magnets, thus in this news article, for clarity the ions are called “magnets.” In the language of the Science Magazine article, they are called “spins”. This experiment is all about frequency. The ions themselves are vibrating at a frequency determined by an electrostatic trap--about 1 MHz or 1 million vibrations/second. The ion qubit is made from two internal energy levels that are separated in frequency by about 12 GHz or 12 billion vibrations/second (microwave domain). When radiation with a frequency that matches either of these frequencies shines onto the ion, then the radiation is said to be in resonance with that transition. For example, 12 GHz microwave radiation will make the ion qubit cycle between two internal states. If MHz radiation is coupled to the ion, it will begin vibrating. In the quantum regime, the quanta of vibration called a phonon can be controllably added and removed from the system. These phonons act as communication channels for the magnets, and are instrumental in generating rich varieties of interactions. Scientists must be clever about generating frequencies. We are constantly being bathed in radiation from cellphones (GHz), infrared (terahertz or 1000 GHz), UV radiation (petahertz or 1 million GHz), and more--much of this goes unnoticed. The ion here is sensitive to only very precise frequencies. 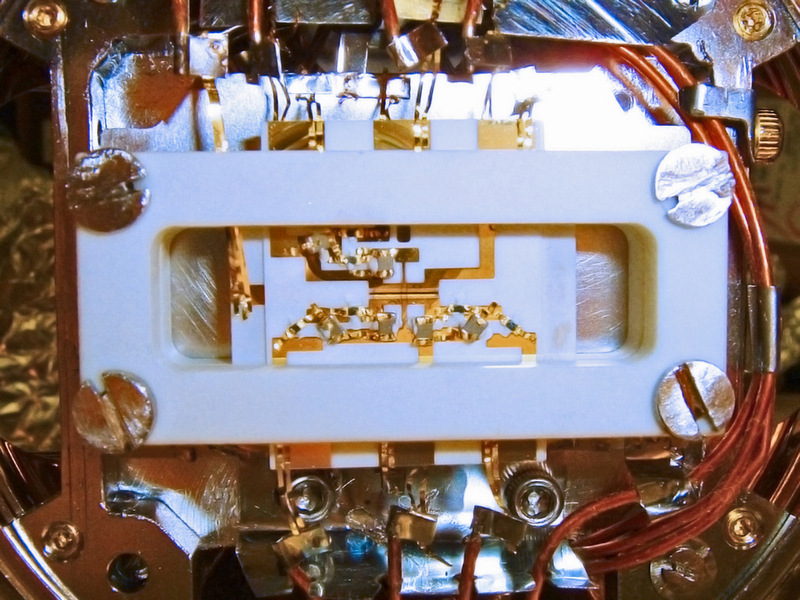 To get that qubit to flip flop between two qubit states, they need to apply a radiation at precisely 12.642819 GHz. To create spin-spin interactions, they also need to simultaneously excite its motion--it is vibrating at a frequency that is 10,000 times smaller. Lasers are the key--here at 369 nm, just barely in the ultraviolet regime. Previously, a JQI news item described how they can use a pulsed laser to generate 12.642819 GHz. Scientists control the frequency, power and the direction of light waves very precisely by hitting the laser beams with sound waves and oscillating electric fields (in devices such as the acousto- and electro-optic modulators). These devices act to add lower frequencies necessary for exciting the motion in the trap as well as fine tune the main laser beam to address certain atomic transitions. This method, called modulation, is versatile and is one of the key features that make this and other quantum physics experiments possible.